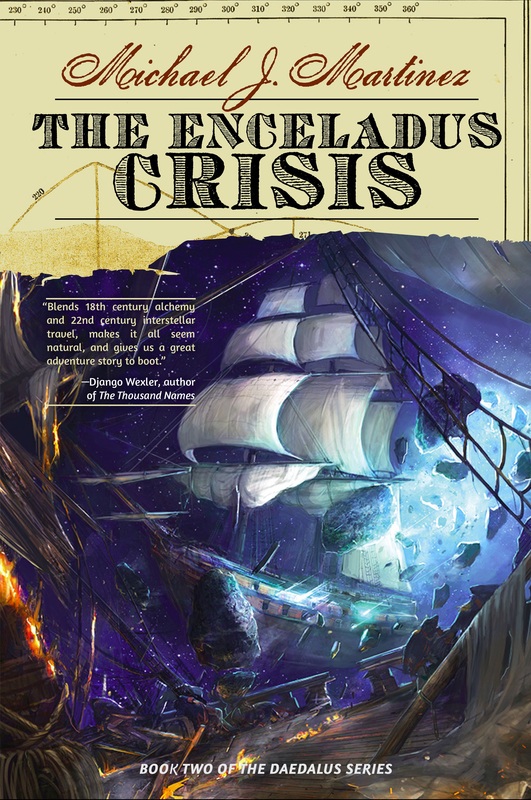 Revealed: The final cover of The Enceladus Crisis! Here it is, you guys. I may be biased, of course, but I think it’s incredibly awesome. Behold, The Enceladus Crisis! The 74-gun third-rate on the cover is HMS Fortitude, captained by…well, you’ll see. The ship bits heavily damaged in the foreground belong to the French, naturally. The artwork is by the insanely talented Lauren Saint Onge. Like me, she has a day job (doing concept art, no less), and suffers from the same affliction of wanting to do more work as a hobby. She’s awesome, and I’ll be posting an interview with her tomorrow. 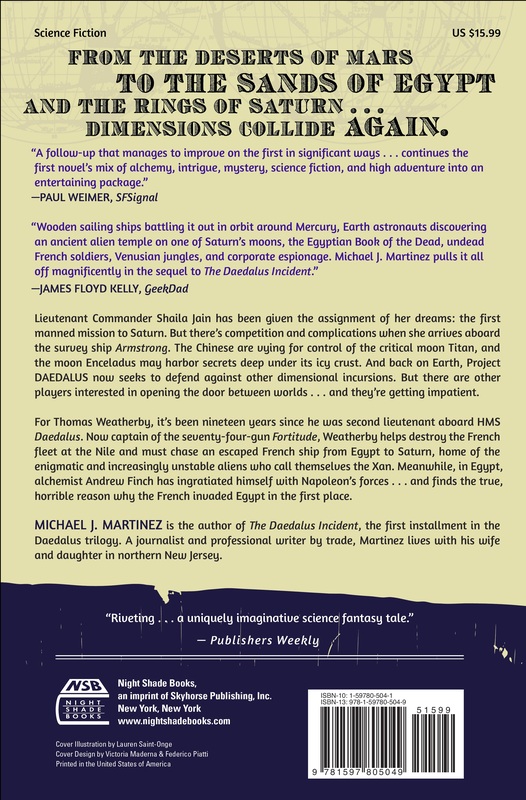 And yes, that’s none other than Django Wexler, author of The Thousand Names, saying very nice things about the book on the cover. Django took the time to read the book even though he’s got two books coming out this year: The Forbidden Library next month, and the Thousand Names sequel The Shadow Throne in July. You should all go buy his books now. Thank you, Django, for all the kind words! The folks at Night Shade Books did a great job putting this all together. They also asked for, and then put up with, my input throughout the process, which was a lot of fun for me. The graphics folks put in a lot of effort to give the title and lettering and such the same look-and-feel as The Daedalus Incident, which is saying something since it’s an entirely different team now. Well done all around. I was hoping we’d get one positive review blurb to put on the back. To have three, and these three in particular, was an embarrassment of riches. The PW and SFSignal reviews have already been published, while GeekDad plans to run theirs closer to the book’s May 6 launch. Did I mention May 6? As in…what, six weeks? Crazy. Pre-orders are available now at Amazon and Barnes & Noble, and you can go through IndieBound to pre-order through your friendly neighborhood independent bookseller too. It will be out in e-book on May 6 as well, and we do expect Audible to release the audiobook around the same time. My thanks again to all involved in making this cover. It’s incredibly amazing. And a hat-tip to SFSignal for giving it a nice boost this morning. I can take very little credit. Lauren Saint Onge and my editor, Cory Allyn, did most of the heavy lifting. I opined when asked, and helped with little details like the rigging and such. Really, it was all them, and the NSB graphics crew. But thanks!